BERKELEY, CA – 40th Telluride Film Festival (August 29 – September 2, 2013), presented by National Film Preserve LTD., proudly announces Oscar-winning production designer Dean Tavoularis as its 2013 poster artist. Tavoularis will attend the 40th Telluride Film Festival over Labor Day weekend to present his poster design to the public and hold a poster signing for festival guests. Tavoularis has spent the last ten years focusing on his work as a painter. His return to film came in 2012 when he was the production designer on Roman Polanski’s “Carnage.” He has worked on over thirty films spanning four decades, landing five Academy-Award nominations and one win for “The Godfather Part II.” Tavoularis lives in Paris and Los Angeles with his wife, actress Aurore Clément. 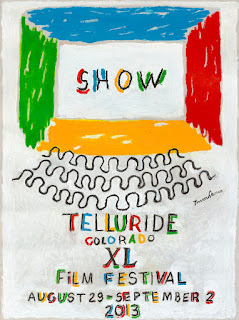 Dean Tavoularis joins a prestigious list of artists who have shared their talents with Telluride Film Festival. Past poster artists include Ed Ruscha, John Mansfield, Julian Schnabel, Dottie Attie, Doug and Mike Starn, David Lance Goines, Chuck Jones, David Salle, Alexis Smith, Jim Dine, Seymour Chwast, Frederic Amat, Francesco Clemente, Dave McKean, Gary Larson, Chip Kidd, John Canemaker, Mark Stock, Laurie Anderson, William Wegman, Ralph Eggleston, Maira Kalman and Dave Eggers. 40th Telluride Film Festival posters will be available for purchase throughout the five-day Festival or by visiting the TFF website atwww.telluridefilmfestival.org. 40th Telluride Film Festival passes are now available at www.telluridefilmfestival.org. Telluride Film Festival is celebrating its 40th Anniversary August 29 – September 2, 2013. To commemorate this special occasion an additional day has been added to the usual four-day Festival, making room for a five-day bounty of special programming and festivities. Passes are now available for purchase at www.telluridefilmfestival.org. The prestigious Telluride Film Festival ranks among the world’s best film festivals and is an annual gathering for film industry insiders, cinema enthusiasts, filmmakers and critics. TFF is considered a major launching ground for the fall season’s most talked-about films. Founded in 1974, Telluride Film Festival, presented in the beautiful mountain town of Telluride, Colorado, is a four-day international educational event celebrating the art of film. Telluride Film Festival’s long-standing commitment is to join filmmakers and film connoisseurs together to experience great cinema. The exciting schedule, kept secret until Opening Day, consists of over two dozen filmmakers presenting their newest works, special Guest Director programs, three major Tributes to guest artists, special events and remarkable treasures from the past. Telluride Film Festival is a 501 (c)(3) non-profit educational program. Festival headquarters are in Berkeley, CA. Telluride Film Festival is supported by Land Rover North America, Turner Classic Movies, Ernst & Young, Film Finances, Audible.com, Telluride Mountain Village Owners Association, Universal Studios, Meyer Sound, The Academy of Motion Picture Arts and Sciences, Bombardier Business Aircraft, Mandarin Oriental Hotel Group, Américas Film Conservancy, Telluride Foundation, Pine Ridge Vineyards, The London Hotel Group, UCLA School of Theater, Film and Television, Dolby, Telluride Alpine Lodging, Crumpler, ShopKeep POS, The Hollywood Reporter, Boston Light and Sound, among others.